The Joint UN Development Programme (UNDP) - UN Department of Political and Peacebuilding Affairs (DPPA) Programme on Building National Capacities for Conflict Prevention is a signature cross-pillar initiative that aims to enhance UN support to national stakeholders on conflict prevention and sustaining peace. Since its inception in 2004, the Programme has engaged in more than 60 countries and provided catalytic support to UN Resident Coordinators and UN Country Teams to advance the UN Secretary-General’s conflict prevention agenda. The Joint Programme is widely recognized for providing thought leadership on conflict prevention, and is considered a unique example of how the political and development pillars of the UN can successfully work together in pursuit of the prevention of violent conflict. The Joint Programme’s efforts focus on building existing and emerging national and local capacities to address, and fundamentally transform the underlying causes of conflict. Recognizing that national ownership, inclusivity and sustainability of peace efforts are key to success, the Joint Programme works on a premise that national actors are best placed to carry preventive work forward. Peace and Development Advisors (PDAs) are at the forefront of the Programme’s efforts to empower national stakeholders to strengthen existing mechanisms and capacities for inclusive dialogue, mediation and national peace architectures. PDAs also support the UN system to effectively adapt and respond to complex political situations and identify areas for preventive action. 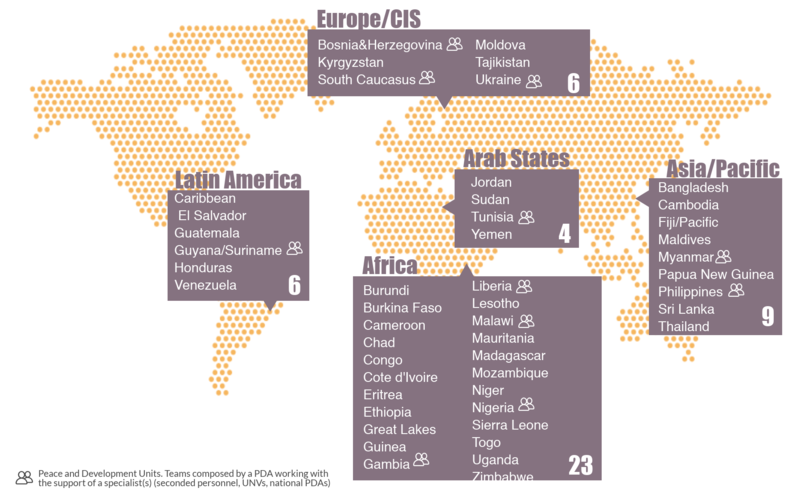 Over the years, the community of PDAs has grown significantly, reflecting the increasing need for conflict prevention as well as the realization of the value of embedding capacities for conflict analysis, conflict sensitive programming, and strategic leadership on conflict prevention within UN Country Teams. * Peace and Development Units. Teams composed by a PDA working with the support of a specialist(s) (seconded personnel, UNVs, national PDAs). Beyond the deployment of PDAs, the Joint Programme also facilitates deployment of short-term expertise to respond and engage in crisis settings, provides coordinated and complementary UNDP and DPPA support, analysis, and engagement in target countries, and builds on the expert knowledge of its stakeholders to share good practices, lessons learned, and engage in a community of practice. Aiming to serve as a platform that brings together various UN tools and approaches, the Join UNDP-DPPA Programme contributes to coherent UN engagement by working in partnership with other UN entities, such as the Peacebuilding Support Office (PBSO), UN Volunteers (UNV) and UN Women.